Wow, a picture really can tell you a lot more about how something fits than a mirror can! 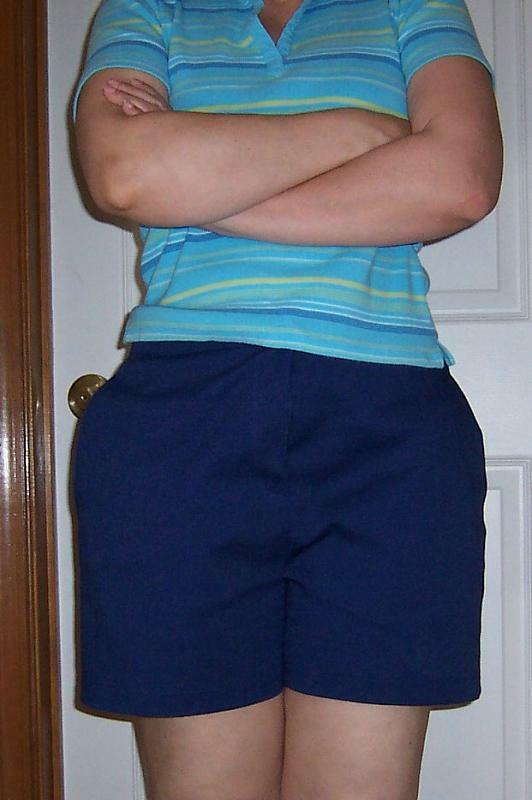 I finished my trial version of the shorts (previous post here), and although I know I made a few mistakes with the zipper and waistband, when I tried them on and looked in the mirror, I didn't think they were too bad. At least not as bad as some of the ready-to-wear shorts I've tried on lately. Even Rich said they looked pretty good. Earlier today I got out the tripod and took a few photos -- I'm not sure if the flash is helping to "enhance" the problems or not, but the areas I thought were just a little bit baggy really look so much worse in the photos! So what do I need to correct? Well, first off, I think the crotch depth needs to be shortened. So I'm adjusting the pattern where it can be converted to a petite version, which hopefully should eliminate some of the extra bagginess. Actually, this makes a little bit of sense to me -- when I do buy ready-to-wear jeans, they petites usually fit me better, but the leg length is always too short. Next, the waist is really loose -- I really could use the waistband for a size 14, but the pattern package has only sizes 16-22. 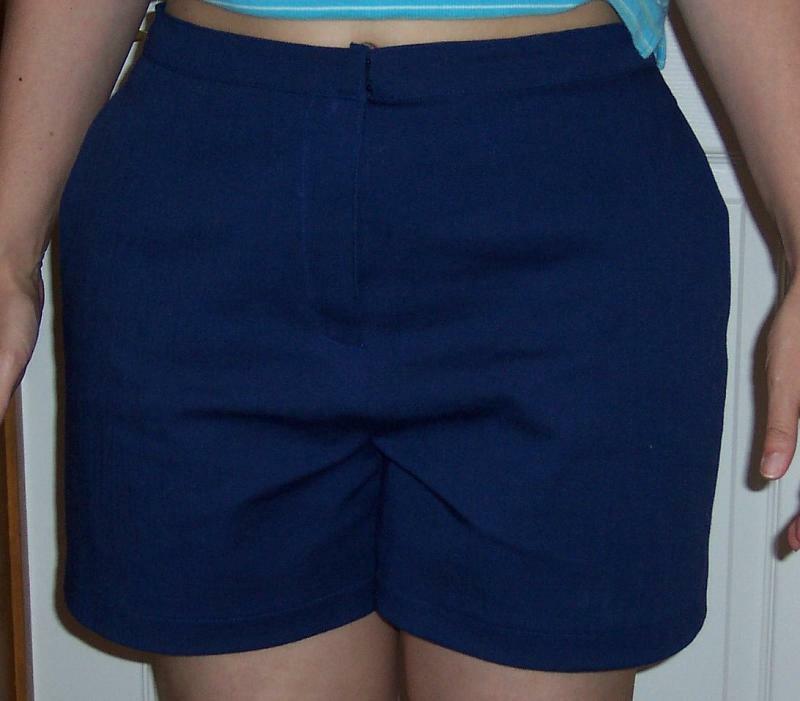 For this pair of shorts, I used the size 16 waist and graded up to size 18 at the hip. For the next pair, I'm going to try reducing the waistband by another 2" and re-grading the side seams from a 14 up to an 18 at the hips, which feel just right. But I also think I need to adjust the shape of the pocket to accommodate the curve from the waist to hips so it will lay smoother. I need to do some more research on adjusting pockets. And on the next pair, I'm going to try to finish the seams as I go -- either by zigzagging or serging the raw edges. I often overlook this on the practice garments because I just want to get to the next step and finish and see if it fits. But from now on, I really need to practice adding this step to my general routine. These shorts aren't too terribly horrifying -- I can definitely wear them around the house, but no where else. Other than the baggy areas, I like them. I like the pockets, too, although Rich said he could see the contrast fabric and thought that it should blend in more. The stretch twill was not too difficult to sew. I used polyester thread and a denim needle and set my machine for woven heavy fabric and all the stitches look pretty good. And it clears a small bit of space from the stash.